Oracle Siebel CRM is branded as one of the most comprehensive customer relationship management (CRM) solutions and a pioneer in the sales force automation. The software enables businesses to maximize the growth of their top and bottom line and deliver exceptional experiences to their customers across all channels, touchpoints, and devices. Oracle Siebel CRM provides users with a vast range of sales, marketing and customer service capabilities and tools that are designed to fit the best practices of over 20 industries. This makes Oracle Siebel CRM a highly sophisticated, scalable, and advanced platform that can be implemented as on-premise and on-demand. One of the most widely-used and popular customer relationship management (CRM) systems in the market today, Oracle Siebel CRM is noted mainly for its sales force automation roots and its vast collection of solutions that are applicable to 20 different industries. Designed to help medium-sized to large enterprise manage their customer facing operations, Oracle Siebel CRM provides transactional, analytical, and engagement tools and capabilities to help users get the job done. While Oracle Siebel CRM capabilities are rooted in sales force automation, it is also able to support conventional processes including managing marketing campaigns and tickets, performing sales collaboration, capturing quotes and orders, rolling out loyalty programs, handling events, setting up help desk, and offering customer self-service, to name some. 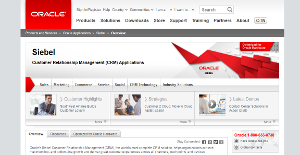 The platform works with other Oracle business apps. Users have the option to deploy Oracle Siebel CRM as an on-premise or on-demand solution, giving them the flexibility they need and enabling them to incorporate the software based on their requirements instead of having to modify their existing setup and processes around it. Oracle Siebel CRM is a multi-awarded and widely recognized CRM software, a clear indication of how it impacts businesses, their performance, and overall growth. Analyst firm IDC declared that Oracle Siebel CRM is the leader of the CRM market when it comes to sales force automation (SFA), marketing and customer service. Datamonitor, another research and analysis agency, placed Oracle Siebel CRM as one of the top solutions in almost every aspect of CRM technology. Enterprises have diverse needs and requirements and no software application can be perfect in such a situation. It is useless to try to find an ideal out-of-the-box software app that meets all your business wants. The intelligent thing to do would be to modify the application for your unique wants, employee skill levels, budget, and other elements. For these reasons, do not hasten and subscribe to well-publicized leading systems. Though these may be widely used, they may not be the perfect fit for your specific needs. Do your groundwork, investigate each short-listed application in detail, read a few Siebel CRM reviews, speak to the maker for clarifications, and finally choose the application that presents what you require. How Much Does Siebel CRM Cost? Contact Siebel CRM for enterprise pricing information and other product details. You can also submit a request for a free trial. We realize that when you make a decision to buy CRM Software it’s important not only to see how experts evaluate it in their reviews, but also to find out if the real people and companies that buy it are actually satisfied with the product. That’s why we’ve created our behavior-based Customer Satisfaction Algorithm™ that gathers customer reviews, comments and Siebel CRM reviews across a wide range of social media sites. The data is then presented in an easy to digest form showing how many people had positive and negative experience with Siebel CRM. With that information at hand you should be equipped to make an informed buying decision that you won’t regret. What are Siebel CRM pricing details? What integrations are available for Siebel CRM? Pros: It provides a huge opportunity for any business to operate seamlessly. When you think of integration, not many CRM tools will integrate with multiple systems in businesses. For the case of Siebel, it integrates well with other applications in your business making it a good add-on to your business. The idea is to manage the data that comes in and out of your system and that is what Siebel does. It is a flexible tool that plays well with other systems and thus no need to change or install new software applications. It has multiple features suited for both medium and large businesses. Cons: Despite it being a modern tool with modern solution to businesses, it has its drawbacks when it comes to usage. It can be difficult to maintain this CRM tool. This happens when you want to solve a situation or an issue you have come across. It does not offer a reliable platform on which you can easily solve these solutions within a short period. This is due to the poor documentation of these bugs on how to fix issues. It would be better if the documentation was great to help users solve issues as they come along. Such documentation will help when you have created a code and you need to fix some few bugs moving forward. Pros: It is all you may need for your CRM solutions. When you think of a CRM tool that offers industry applications and has a rich set of features to help you all the way, then Siebel is that tool. It brings modernity at your doorsteps to help you manage data and your business operations with ease. The wide functional areas it comes include among them marketing, sales, pricing, call center and eservice. On the part of industry applications, it accommodates the telecom, auto, and manufacturing industries. When you search the market for such a CRM tool, you will not find any other like what the Oracle Siebel has to offer. Cons: It can frustrate a user if the user did not take the time to learn what role each feature plays. It is a complex tool due to the numerous functionalities it has in place. A user should understand that they do not have to use all those features. If you go in without understanding what it takes to make the best use of this product, some of those features will become obsolete to you. You have to take the time to train and understand what is needed for each of the feature and become an expert on the same. With such a rich functionality, you can be confused and find it difficult to implement into your business. If you need more information about Siebel CRM or you simply have a question let us know what you need and we’ll forward your request directly to the vendor.